Two years ago, I started the Food in Jars Mastery Challenge, a yearlong challenge to broaden and improve my preservation skills. For no obvious reason, I only made it through March. When I saw that Marisa was running another challenge this year, I decided to jump on board again. I have no idea how long I’ll last, but, for the moment, I have good intentions. 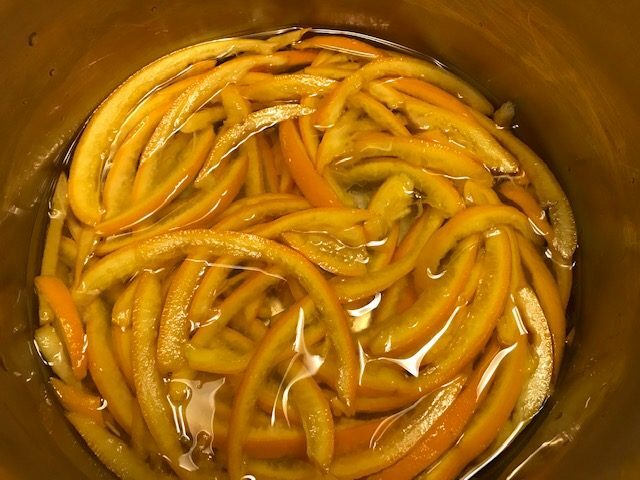 January’s challenge is to play with preserving citrus. The technique is open-ended. I’ve always wanted to candy my own citrus rind. 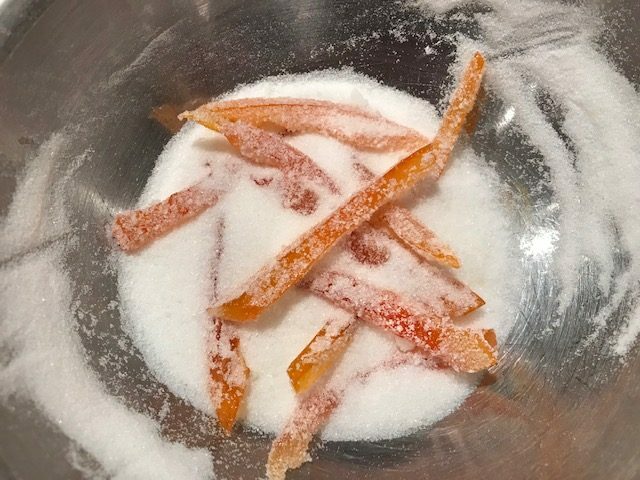 Candied orange rind is a confection I love to use in baking all year long added to scones, shortbread, and baseler leckerli at the holidays. I’ve always bought it commercially made, but when I’ve seen recipes, it seems like an achievable DIY kitchen project. I also love repurposing kitchen scraps into delicious things to eat. This time of year, Howard eats a lot of oranges, and we both eat grapefruit for breakfast every morning. I asked Howard to set aside some of his orange rinds plus I saved grapefruit rinds for a few days to support a parallel experiment. In the meantime, I researched recipes. Some recipes only used the outer peel, discarding the pith, while others used the whole rind. The candied peel I buy uses the whole thing which is also much less work and less waste so that’s the approach I chose. There were many different methods for preparing the rind for candying. Some cut the rind into strips first. Others started with halves of rinds – in some cases with any membranes to be scraped off later and others already “clean”. I was concerned the strips would get overcooked, so decided to start with the larger pieces and cut them into strips afterwards. The orange rinds were already cleaned and the grapefruits were not, so I decided to try both ways to compare. There were also many different approaches for boiling the rind. In all cases, the purpose is to remove bitterness. The variety came in the timing: how long and how many times? In some recipes, you simply bring the peel and water to a boil then immediately draining and repeating. Other recipes, the rind is boiled for 2 minutes, 3 minutes, anywhere up to 15 minutes before repeating. And how many times? I saw recommendations between 2 and 5 times. The strength of the simple syrup was also variable, but most frequently it was 1:1 (water to sugar). 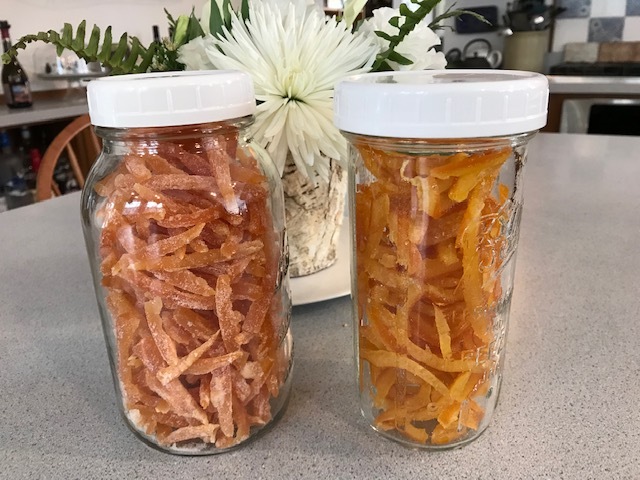 Armed with these ideas, I set out to make one batch of candied orange peel and another of candied grapefruit peel. The only difference between my chosen method for the different batches was that the grapefruit still had all the membranes attached. 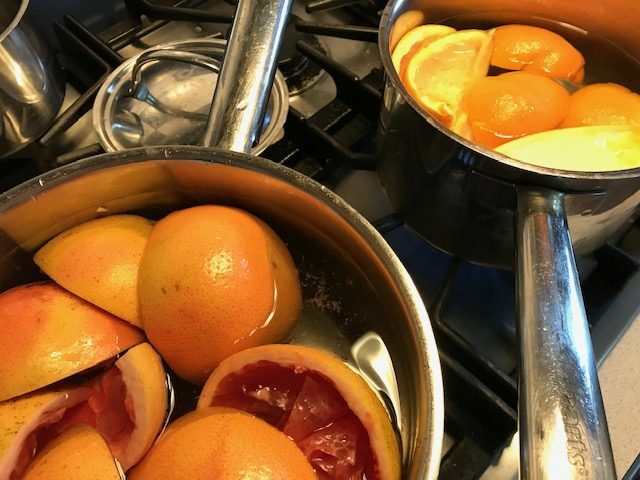 If you are making candied peel from fruit you’ve juiced and you’re trying to keep things as simple as possible, doing the boiling step with those membranes still attached seems like the path of least resistance. However, I found that after the rinds were softened from the cooking, it was difficult to get down to the pith. I used the serrated edge of a grapefruit spoon to scrape, but it never seemed like I got all the membrane off. In retrospect, I wish I’d cleaned the rinds at the start. Everything else was simple enough. Time consuming, but manageable if you’re hanging around the kitchen anyway. The candied orange peel is amazing. It’s far superior to anything I’ve bought. I might be making more before the winter citrus season is over. 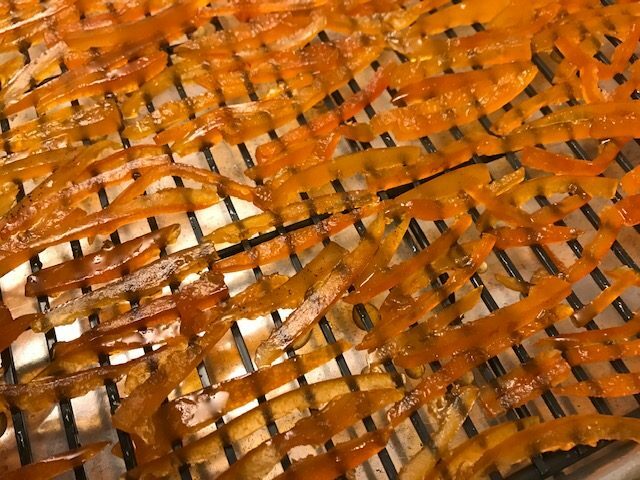 On the other hand, the candied grapefruit peel has a bitter finish. In an attempt to counter the bitterness, I coated the grapefruit peel with sugar. The coating gives the peel an attractive look and cuts the stickiness when handling it. However, the bitterness persisted. Maybe grapefruit, being naturally more bitter than orange, needed more rounds of boiling to mellow? I’m hoping that I can still use it in baking so it won’t be wasted. I’ll try some of my recipes that use candied orange or lemon peel to see. If any of the membrane from the fruit remains, scrape or pull it away from the inside of the rind. Place the rind in a medium saucepan and cover with cold water. Bring to a boil. Let boil for 3 minutes. Drain. Repeat 2 more times. This reduces the bitterness of the rind’s pith. After the final (3rd) boil/drain cycle, let the rind cool until it’s comfortable to handle. This will take 10-20 minutes. Slice rind into ¼ inch strips, no longer than 3 inches. Wash the pot to reuse for making simple syrup. Bring the water to a boil. Add the sugar to the pot. Turn off the heat and stir until the sugar dissolves. Note: If you think your fruit is especially small or large or you are scaling this recipe up or down, at this point, do a rough measure of the strips of rind in a liquid measuring cup. Calculate 75% of the volume of rind (round up to the closest ¼ cup so it’s easy to measure). Make a simple syrup from the calculated amount of water and the same amount of sugar. My 2 orange rinds (from average-sized fruit) yielded 2 cups of rind strips, so I made simple syrup from 1½ cups water and 1½ cups sugar. Add the rind strips to the simple syrup and bring to a boil. Reduce the heat, and simmer, stirring occasionally, until the peel is soft and translucent, 45 minutes to an hour. The rind will absorb most of the syrup, and water will evaporate from the syrup so it will thicken as it cooks. Towards the end, you can turn up the heat slightly to accelerate evaporation. Don’t let it burn. Once the rind is cool, cover it lightly with a clean tea towel or paper towels to keep it clean (it’s sticky). Let it sit for 1-2 days to dry, though it will remain a little tacky. Optionally, after drying overnight (8 hours), toss the rind in white sugar. Do this in small batches to avoid clumping. Transfer the coated rind to a rack set over a baking sheet (don’t use the original one without wiping it clean – it’s sticky!) and let it dry further for another day. Transfer candied rind to an airtight container. It should last 3 to 6 months.